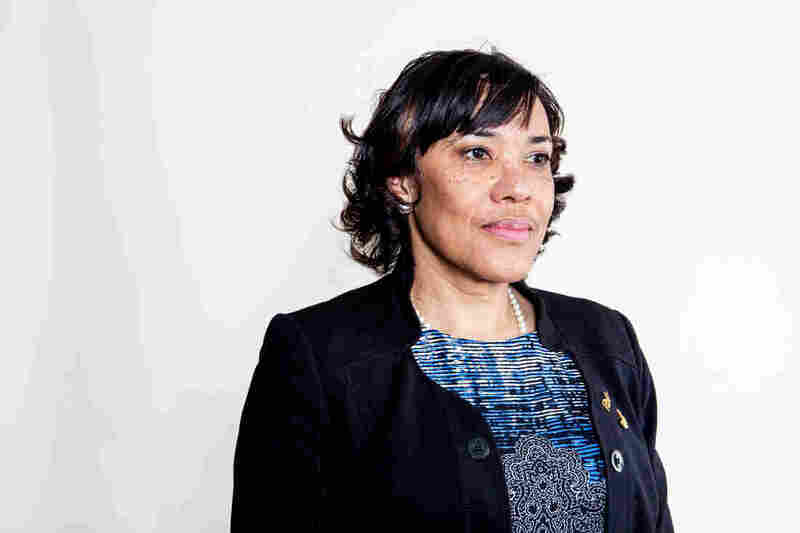 Flint Mayor: 'Politics And Profit' Perpetuated Lead-Tainted-Water Crisis : The Two-Way Mayor Karen Weaver was elected in November after vowing to address the problem, which began in 2014. Thursday, the head of the EPA's regional office resigned. High lead levels in Flint, Mich.'s water has led President Obama to declare a state of emergency, as criticism mounts that the problem has not been handled promptly. "The people weren't put first, the health of the people was not put before profit and money," Flint Mayor Karen Weaver says in an interview with Ari Shapiro on All Things Considered. The problem started when Flint switched its water source to the Flint River in April 2014. The new supply was harder water, which corroded the city's pipes and leached lead into the tap water. Even though the city switched back to its original supply in October 2015, the damaged pipes continue to contaminate the water. Weaver says Flint residents don't know when the city's water will be safe to drink again — even though they're still paying for it. President Obama's declaration of a state of emergency last week freed up $5 million in federal aid for the city. Weaver was not in office when this started. She was elected in November after vowing to address the city's water problems, and as Michigan Radio's Lindsey Smith reports, "one of the first things she did was to declare an emergency in the city." Weaver met the president and some of his senior advisers earlier this week to discuss Flint's crisis. Snyder made the emails public on Wednesday following widespread criticism. He said he was releasing them "so that you have answers to your questions about what we've done and what we're doing to make this right for the families of Flint." "I haven't seen what's in those emails but I will tell you this — it's something that he needed to do because one of the issues we've been dealing with is broken trust. And we've been kept in the dark regarding some information regarding our water. We've been given misinformation about the water, and the only way the governor can — if he can — rebuild trust, is to start doing that. So it's a start for him, I suppose." "You know what, I'm glad those high-profile figures are out there, and they're putting the pressure on the governor and holding him accountable for some things. What I've said is, we have an investigation going on and I can't wait to hear the results of that investigation because everybody that should be held accountable needs to be held accountable. We want to know who knew what and when they knew it. And that's from the governor, all the way down to if it includes local officials. We want everyone to be held accountable and if it means they have to be removed, so be it." "The other thing we need to do is start looking at infrastructure. Because even though we've switched back to Lake Huron water through Detroit, those lead service lines are the issue. And how long are we supposed to wait for biofilm to build back up? Nobody can tell us how long that can take. And we need to be able to drink our water." "You know, it's a terrible thing, no community should ever have to go through what Flint has gone through, but I'm also looking at the possibility of what can come out of this. And I've always believed in Flint, I'm excited about the potential, and you know, we've got to get this fixed. But there is a lot to look forward to in the city of Flint. And you're going to have me back, because I'm going to be telling the second part of this story." A previous version of this story quoted the mayor as saying the rainy-day fund contained between $5 and $6 million. She actually said it is between $500 and $600 million.